In most ways, KDE’s Plasma 5 is an improvement over earlier releases. It is more minimal, and many functions are easier to use than in Plasma 4. Certainly, it is more stylish and often better designed for the current generations of computer users. However, in at least one case, Plasma 5 has left a mess. To judge from my Debian Stretch installation, Krunner, the multi-function command line menu favored by experts has not only dropped several features, but made other features more difficult to use, creating unnecessary complications. As you may know, Krunner is one of the half-hidden secrets of KDE. Many users find it only by accident after months or even years of using Plasma. However, those who discover Krunner soon learn to value it as a convenient shortcut that, although it requires typing, is more efficient than clicking through the levels of the menu to launch an application and use a particular feature. At times, it almost seems as though you could manage all your computing from Krunner. Among other things, you can launch commands, open websites using the abbreviations defined in System Settings > Shortcuts > Web Shortcuts, send emails, convert units of measurements, open particular system settings, and view the date and time. It takes time to learn, but once users have memorized its functions, it can become an essential utility. In fact, I sometimes suspect that Krunner survives largely because many Plasma develops use it themselves. Yet, if so, the modifications in Plasma 5 become more inexplicable, because they seem to have been made by people with no sense of how useful Krunner was in earlier releases. So what is so wrong with the latest version of Krunner? To start with, it is undocumented, although the Plasma 5 release series is not at 5.10. The only way to find what works and what doesn’t is to look at older documentation and check the functions one at a time. After I spent ninety minutes trying out all the previous functions, and adjusting other settings in KDE, such as the default applications listed in System Settings > Applications, I conclude that the latest version cannot open man pages, switch between desktops and Activities, spell-check, or enter special characters. Other functions still work, but require that the associated applications are already open. 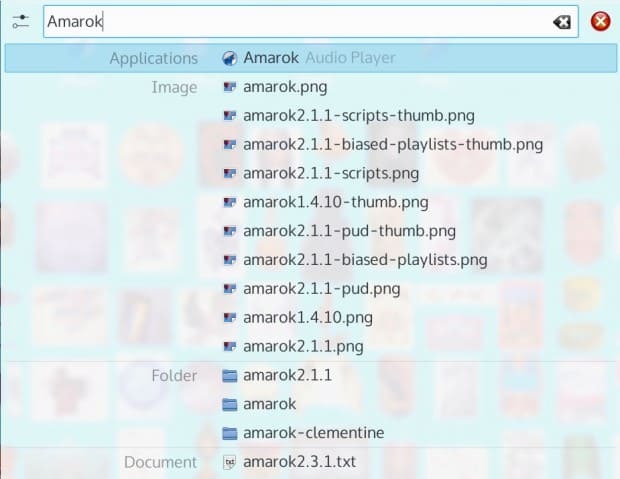 Yet, if Amarok is already open, why bother to start a song from Krunner? Similarly, if you have the Konsole terminal open, why enter a command with Krunner — especially since Krunner still has the annoying habit from earlier versions of closing after each command is entered? In other words, the latest version is far less versatile than earlier ones. Even more importantly, Krunner’s behavior has drastically changed. By default, Krunner still opens at the top middle of the screen. However, unlike in earlier releases, it can no longer be re-configured to open elsewhere. This behavior is especially annoying if you have a panel on the top edge of the screen that is set to be Always Visible, and is partially obscured by Krunner. Then, just to make matters worst, the old shortcut of Alt+F2 is not included among Plasma’s defaults. Although users can add their own shortcut, or perhaps a desktop launcher, until they do, the only way to start Krunner is by opening it in the menu, which is especially annoying considering that the current version retains the old habit of closing each time a command is entered. This behavior seems strange for a tool that is supposed to be an integral part of Plasma, and even stranger for one designed for advanced users, who are more apt to use keyboard shortcuts. Another annoyance is the over-simplification of the window. In earlier releases, Krunner had a separate window for managing processes, one of its most convenient features. The window included a search field and listed statistics like the amount of memory each process used and who owned it — nothing you couldn’t read by running the ps command, but a graphical rendering of the same information from which processes could be both killed and examined. However, in Plasma 5, the separate window is gone. Instead, to kill a process, you have to enter the kill command in the entry field, then choose the application to kill from the list of suggestions generated, including files with “kill” in their names. Additional information about the processes is absent, making the function an unnecessary guessing game until you have entered most of the name of the process to kill. It is a clumsy complication of a function that worked fine the way it used to be. Killing a process returns other irrelevant information. In fact, the basic assumption behind the latest Krunner appears to be that it is used mainly to search a user’s home directory. That it does well, with possible hits tidily listed under different categories. 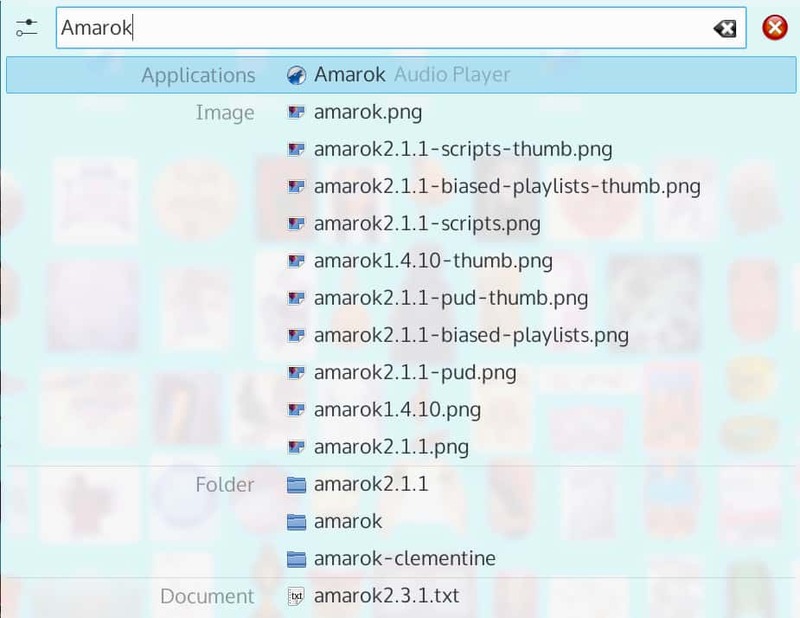 I would even go so far as to say that it is the most useful search tool built into Plasma, being faster and easier to use than the search function built into the Dolphin file manager, and offering more organized results than Recoll, which must be installed separately. In Plasma 5, Krunner is assumed to be primarily a search tool. 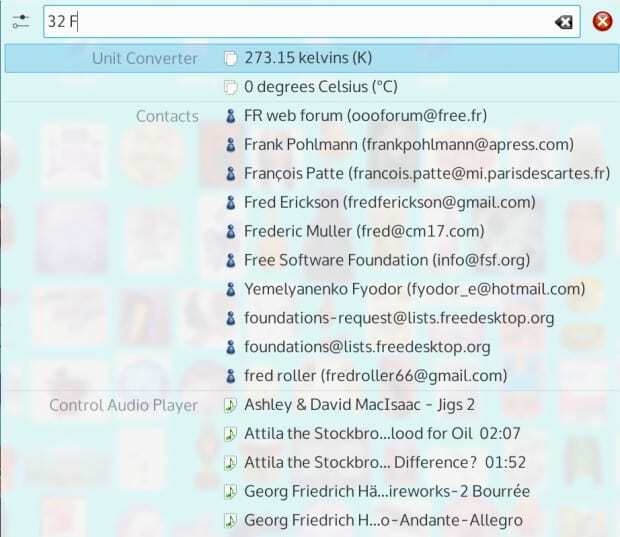 The trouble is, Krunner is more than a search application. As a result, the listing of near-hits is often annoyingly unnecessary. For example, if you want to convert the temperature of 32 Fahrenheit to Celsius, the results returned display any listing of the numerals or the abbreviation F, returning completely irrelevant Contacts and audio files. Admittedly, unit conversions are at the top of the list, but surely it can’t be that difficult to suppress other possible hits when other functions being used? Yet the same irrelevant results are given even for simple functions such as listing the date and time. Just because the possible hits can be quickly generated is no excuse for listing them when they are irrelevant. In Plasma 5, even the conversion of one measurement to another is given irrelevant near-hits. Krunner used to be an elegant application, minimalist yet always to the point. However, because of the functionality changes and the design irrelevancies of the latest version of Krunner, the experience has changed drastically. Now, between its own innovations and behavior it has inherited from earlier versions, Krunner feels clumsy and has become annoying to use. Once I featured out its quirks, I can still use it, yet I find myself avoiding it because much of its convenience is gone and the unfiltered results give it a bloated feeling. Usually, I am all for minimalism in the sense that I prefer applications to be no more complicated than they need to be. In the past, I have frequently criticized KDE for being slow to organize its interfaces, and in general I have nothing but praise for how Plasma 5 has rethought so much of its desktop environment. However, in the case of Krunner, misleading assumptions seem to have been made. Too often, the minimalism has gone beyond efficiency to create new inefficiencies by not thinking things through and including too much in results. I suppose that Krunner is a low priority, since many users never open it, but I can only hope that in future releases, Plasma restores Krunner to its previous efficiency. I used to love KDE. Still enjoying KDE 4. But KDE, like GNOME, seems to have lost interest in producing useful software. They want to follow trends, and they want to throw out all the useful software and reimplement it every few years. Just when one version finally reaches feature parity with the previous, and gets the bugs out–time to start from scratch again! Useless. The CADT model was discovered with GNOME, but it has infected KDE. I encourage you to try TDE. It’s great, works great, fast, light on resources, and it just works. The developers want to make and maintain software that works, not reinvent the wheel every few years. KDE 3.5 was great, and it lives on, still great, as TDE. Hi there. Anyone konw how to set Priority of entries listed in Krunner?